If the plague struck now, I might be one of the first to go. Thin and sunken, tired and malnourished. My glands would swell, my muscles would become rigid, fever would set in, then convulsions, then my eyes would set into a light infinite gaze towards the eons of space. And that would be that. I just finished a book about the plague. 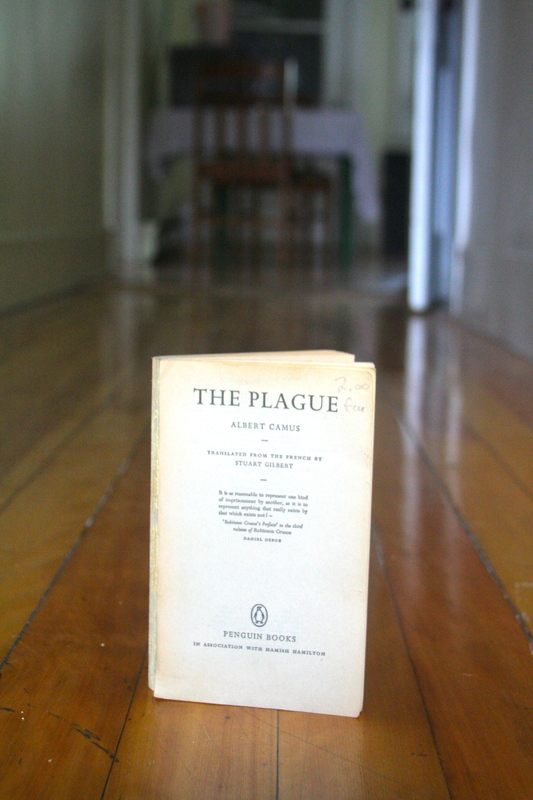 Entitled, ‘The Plague’, and written by Albert ‘The Plague’ Camus. Real good. Top Ten best books I’ve read, likely. The chair was really comfortable, and most of all, punk rock. The name of Camus stuck in my head until I was wandering around on the south end of Saint Laurent and noticed an old bookstore, an anarchist book store next to the creepiest and most psychedelic used clothing store. I browsed, found the Camus section, asked the bookman for his advice and bought ‘The Plague’ for a toonie. I got two jobs in one day yesterday. I know, it is shocking even to me that I can make two employers think that I’m committed to the future, and not going to flake out on them in six to eight weeks. The power of a collared shirt and a haircut is something to be reckoned with. But the possibility of full-time French still hangs in the air like a damp Camembert odour. But life begins again, and the anti-plague serum of employment has been thrust upon me. One of the characters in the book, Tarrou, believes that all people have the plague, in that, every decision we make ‘has an indirect hand in the deaths of thousands of people’, and that it is everyone’s duty to fight against this destructive human impulse. All I maintain is that there are pestilences and there are victims, and it’s up to us, as far as possible, not to join forces with the pestilences. My mind eloquently portrayed through a fictional character. Now to make the decision that will kill the least amount of people, or at least, join forces with the least amount of pestilence. *All quotes by Albert Camus.